The door to the governor’s office. The invitation to the four-year-old girl’s birthday party instructed guests to bring no gifts. It was not an effort to impart a precocious lesson about materialism, but a nod to the state ethics code and the occupations of her parents: Colleen Flanagan Johnson, the senior adviser to Gov. Ned Lamont, and Michael Johnson, a lobbyist at Sullivan & LeShane. Other lobbyists are in their social circle, and a gift from one of them would have violated state ethics rules barring gifts of more than $10 to a state official like Johnson Flanagan for other than a “life event,” such as a birth or wedding. Birthdays are not life events, not even for four-year-olds who like unwrapping presents. Not every complication arising from the couple’s overlapping roles at the State Capitol will be so simply resolved. 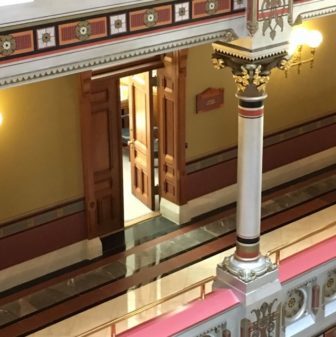 Connecticut’s ethics code has clear rules about gifts and direct financial gain, but less so about harder-to-value commodities so crucial to lobbyists, things like information, access to decision makers, and the perception of influence. In consultation with the Office of State Ethics, the Lamont administration and Flanagan Johnson finalized their own rules this week: She will not meet with any of her husband’s two dozen clients, who include MGM Resorts International, a central player in the fight over casino expansion; and she and her husband will not talk about his clients and the issues on which he lobbies. Where that line is drawn is a matter of opinion, not law. Under the ethics code, which is established by state laws that have not changed in decades, there is no legal bar to Flanagan Johnson acting on any issue of importance to her husband or his employer, Sullivan & LeShane. Under state law, lobbying clients are prohibited from basing their fees on results. MGM is contracted this year to pay $150,000 to Sullivan & LeShane, one of at least three lobbying firms it has retained in the state. Flanagan Johnson, whose career has revolved around messaging and imaging in the worlds of politics, government and business, agreed. 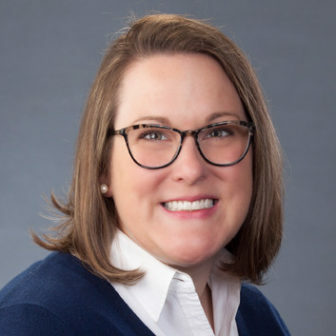 She has provided Drajewicz and Robert Clark, the governor’s legal counsel, with the names of her husband’s clients, which also are a matter of public record at the Office of State Ethics. Eight years ago, when Colleen Flanagan was the communications director for the first year of the administration of Gov. Dannel P. Malloy, her relationship with Michael Johnson was less problematic. The couple was not yet married, Flanagan was not in a policy making role in the governor’s office, and Johnson was then employed by Gallo & Robinson, a so-called “white hat” firm specializing in non-profit clients, including the ACLU and a gun-control group. Johnson proposed in November 2011, the day after Flanagan left Malloy’s employ. He took her back to the Capitol, climbing to its dome to give her a diamond.They were were married a year later. Now, Flanagan Johnson is the senior adviser to Lamont, sharing an office directly across from the governor with Paul Mounds, the administration’s chief operating officer. And Johnson, who says he already has had business conversations with the governor’s staff, has a client in the midst of the one of the most expensive lobbying battles in recent history — the fight over rights to casino expansion and, more recently, sports betting. MGM is fighting to block the Mashantucket Pequot and Mohegan tribal nations, the owners of the Foxwoods Resort Casino and Mohegan Sun in eastern Connecticut, from building a casino off I-91 in East Windsor to blunt the loss of market share to the casino MGM recently opened in nearby Springfield. Andrew Doba, a spokesman for the tribes’ joint East Windsor project, said the tribes were untroubled by an MGM lobbyist being married to the governor’s senior adviser. David Cappiello, one of the lobbyists for the tribes, said he can empathize with Flanagan Johnson and Johnson. Cappiello, a former state senator, is married to a lobbyist for the health insurer Anthem — a job his wife held while Cappiello still was in the Senate.